This incomparably superior, quality metal polish is Autosol LLC.’s most popular product. It has won three international gold medals and is recommended by manufacturers, museums and restoration experts around the world. It safely and easily removes oxidation, corrosion, stains, and rust. It produces a brilliant reflective luster and leaves an invisible protective coating to ensure a long-lasting shine. 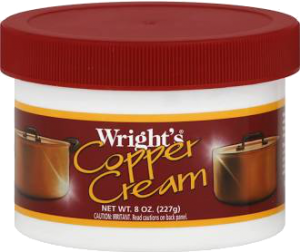 Wright’s Copper Cream cleans and polishes copper while restoring its natural color and shine. This mild formula removes tarnish, erases discoloration and rinses off easily. Experience the good feeling of clean. Made in the USA. 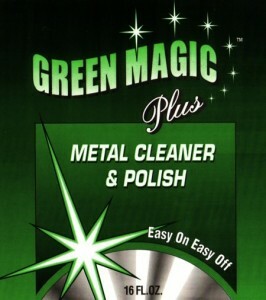 Green Magic Plus Metal Cleaner & Polish. Green Magic Plus metal polish removes hard water spots, rust, tarnish, oxidation, heat discoloration, and stains that other metal polishes can’t touch.